The Yeager Creek Ranch is situated off of Yeager Creek Road approximately 40 miles west of Austin in Henly, Blanco County Texas.The property features a frame home that was moved from Austin and has benefited from numerous additions. The house is approximately 3,800 SF one-story frame ranch house with a metal roof that has been well cared for. The house is a 4/3.5 with a living room with a wood burning fireplace, kitchen, small dining area and wood floors. The generous porch and outdoor fireplace allow for enjoyment of the landscape and outdoors. A historic 2/1 stone farmhouse with a fireplace has been remodeled as a guesthouse on a private hilltop across the creek from the main house. There are assorted outbuildings, barns, garages and cattle pens of nominal value. There are two concrete dams and two concrete low water crossings on Yeager Creek. The Ranch is well fenced to hold livestock. The property has all that the best of the Hill Country should have dramatic views, fertile fields, hilltops, oak and cedar and abundant native game. Three functioning wells, septic, and Pedernales Electric service. The propertys most compelling features are located along the 3,200 feet of both sides of Yeager Creek and 9,300 feet along a spring-fed tributary of Yeager. 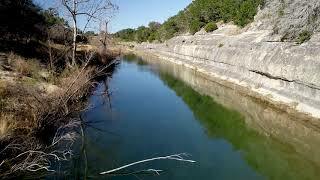 The property is approximately 40 miles west of Austin in Henly, Blanco County Texas. The Sneed Ranch is situated off of Yeager Creek Road.